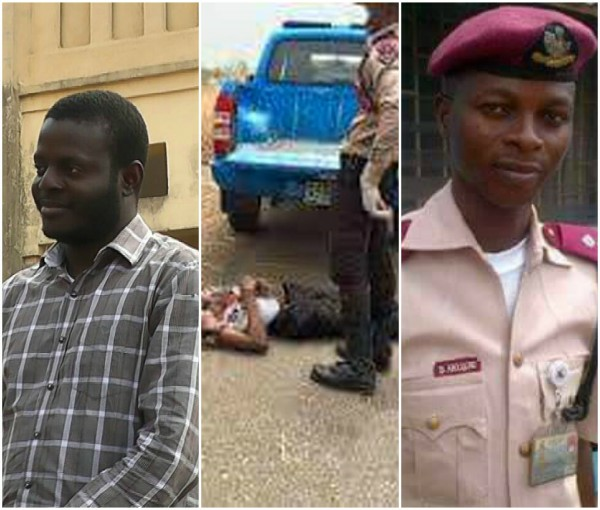 Sola Olagunju, the reckless driver who crushed an officer with the Federal Road Safety Corps (FRSC), Sunday Abolusoro, to death in Ondo state has now signed a “documented agreement” with the family of the deceased. The signed agreements have been documented in form of a Memorandum of Understanding (MoU) between Mr. Olagunju and the families of late FRSC officer Abolusoro. Two sources in both families confirmed that the lawyers of the two parties were present in a meeting where the agreement was reached and signed. Olagunju had on Saturday, November 25th, 2017, killed Abolusoro while he was performing his lawful duty on the Akure/Ilesha express road. The reckless driver had speedily veered off the expressway and struck Mr. Abolusoro, a Deputy Commander (DRC) killing him instantly during a stop and check by the Federal Road Safety Corps manning the road. A wife, two children and aged families, survived the 37-year-old officer. The FRSC in the state had vowed to get justice for the deceased officer in court immediately he was killed. On Wednesday, December 6th, 2017, the police arraigned Olagunju for manslaughter before the Magistrate Court sitting in Akure. The signed agreement was reached with the wife of the late FRSC officer on how best to take care of his two young children and the family he left behind. A source who pleaded anonymity revealed that the family members were not after the prosecution of the killer driver (Olagunju) despite being responsible for the death of their breadwinner. According to the source, the total sum of N5m would be paid to the family of the deceased in order to help his widow start a business so that she can take good care of their children. This source also informed that the money will be disbursed to the wife on a monthly basis.